of all the photo accessories I bought in the last year. Part 1, Sirui K-40X ball-head. Instead of one big message I will break this up to be multiple messages I post in a single topic. It may take me several days to do this. All reviews now posted. I will lead off with the biggest-ticket item. My new ball-head, the Sirui K-40X. In January I bought a new Sigma 150-600mm Contemporary lens, and quickly found I did not have a tripod setup that could hold it steady. As a matter of fact my Sunpak carbon-fiber tripod (the good one) had broken, and I only realized it when I tried to use it with the new lens. As I shipped the tripod back for warranty repair, I began looking at my options for holding this new lens. 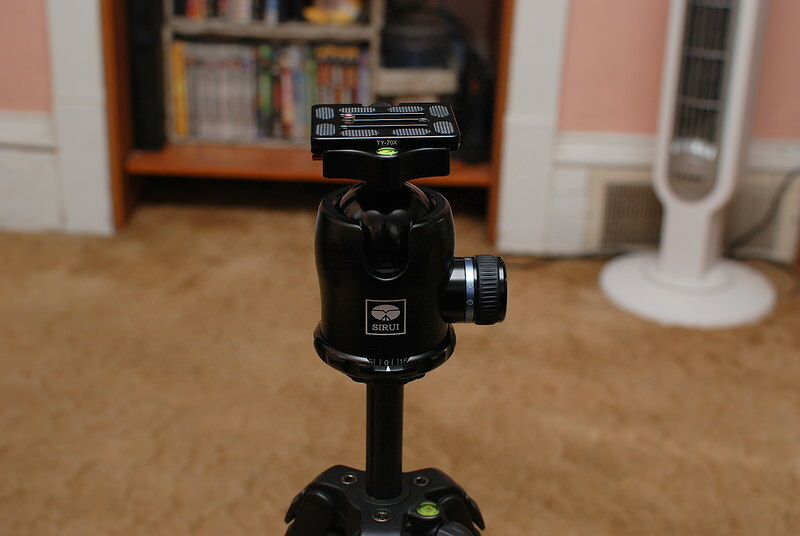 I actually have a really good Vanguard monopod, but I did not have any sort of head for it. I have another aluminum (cheap) tripod, but the ball-head on that was so bad to use that have not really used it since getting the Sunpak tripod. I tried using that ball-head on the monopod, but it basically made a nice monopod bad. Added on to this, I really never liked the fact that each of the heads of these tripods had proprietary quick-releases. Want to change camera or lens, I have to also remove and replace the quick-release plate. More time and fumbling around. I wanted to fix this at the same time I solved the problem with the lightweight tripod heads. So I started researching. It only took a short period of time to realize that I can either go Arca-Swiss compatible quick release system or Manfrotto system. And it looked like Arca-Swiss was the VHS of this Betamax-VHS competition. So now I looked at the best affordable Arca-Swiss compatible ball-heads, and reviews of Sirui ball-heads kept appearing. By this time my Sunpak tripod was repaired, and I decided that the legs are sturdy enough to both hold a heavy Sirui ball-head and my heaviest camera/lens combo. I decided to settle on the K-30X, the 2nd-biggest of Sirui's lineup. Somewhere I discovered a live auction for not the K-30x, but instead the K-40x, which is the largest ball-head (with a whopping 44mm size ball). I put in a bid, and I low-balled it a little since it looked like a possible store display or rental, but basically new. They sell online for $160+, I won the auction for $108. Far less then the K-30x would have run me new. I just hoped the bigger size would not be a problem. There it is mounted on my Sunpak tripod. Next with my Nikon D7000 and Sigma 18-35mm Art lens. It should give a bit of scale to the photo. Sirui uses an Arca-Swiss compatible quick-release, but it is not exactly like Arca-Swiss. An Arca-Swiss plate has 2 "bumpers" on the underside where they hit the side of the clamp to prevent the camera/lens from sliding off when you have the clamp loosened up a bit to adjust for the balance point. Sirui plates don't use the bumpers, but instead have spring-loaded stopper peg with a release button. The plate has a wedge on both ends that pushes the peg out of the way to slide it on the clamp, but you cannot slide off unless you press the release button on the side. If you use the Sirui hardware, it slides on and off without having to open up the clamp all the way, and is much quicker to use. But you can still clamp on to standard Arca-Swiss plates and even adjust the balance as the Arca bumpers will still run into the sides of the clamp as a safety. Long story short, you can spend a lot of extra money for the Sirui plates, or just use the dirt-cheap Arca-Swiss compatible hardware that is available everywhere. 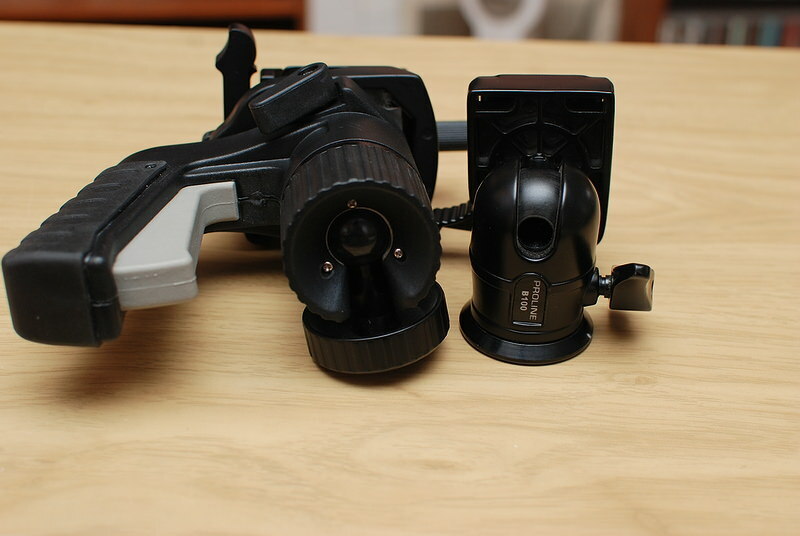 Here is a comparison with the previous tripod heads I have. 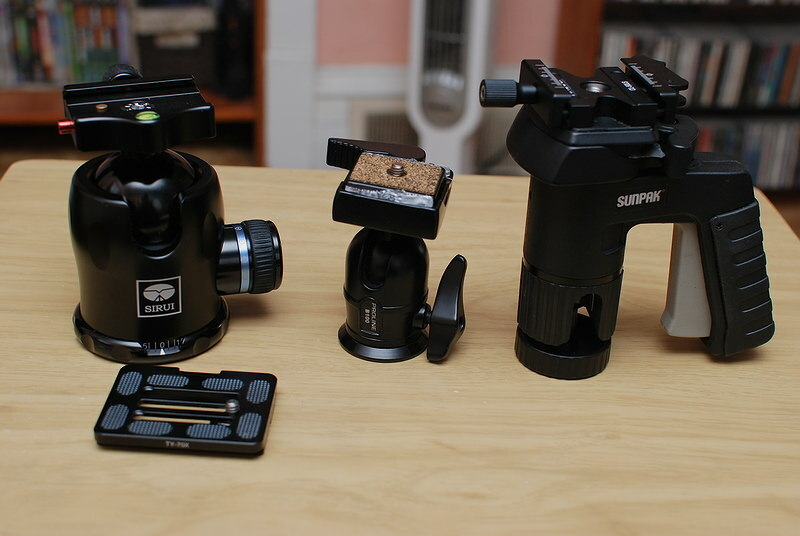 Sirui on the left, the junky ball-head in the center, and the pistol-grip head that came with my Sunpak tripod. Bit of a size difference, huh? The Sirui has 2 obvious knobs and 3rd adjuster knob built into the main one. Not visible in the pics is a knob on the back-side, bottom that locks and unlocks a pan-joint. You can pan with this head without loosening the ball. There is a thick grease that dampens the movement of the pan, and you can use this to do a video pan, I think. There is also a scale on the pan control to allow you to do a panorama series with uniform steps. It is really resistant-enough to motion that a person could just leave it loose for most purposes. The ball tension knob has plenty of adjustment, and there is a thumbwheel-turned limiter on the tension release. This will limit how much you can release tension so the head won't drop limp with the weight of your equipment setup. Going from a heavy body/lens combo to something a lot lighter, just turn the adjuster and open up the tension until you can move the ball-head again, then set the limiter to this point and you cannot have the body accidentally drop down. Really it is giving me a new respect for ball-heads using this. I was really reluctant to stop using the old pistol-grip head because it was so easy and quick to move. When you have the tension right on this ball-head, it can be moved accurately without having the massive "droop" as you try to tighten it all up with a lesser head. The knob on the top is for screwing the clamp of the Arca-Swiss quick release. It works smoothly and clamps down tightly. It is easy to transfer torque from finger-tips to the clamp. There is only a bit over 90-degrees of tilt available, so the pan function must be moved around 180 degrees if you want to go from a large up-angle to a large down-angle. Really the same is true with my old Sunpak head, but that does reconfigure very quickly. I have every confidence that if a person was to buy a Wemberly Sidekick-style gimbal, it would mount very securely to this Sirui K-40X and work well, if the drag of the pan-motion was not a concern. There are even 3 bubble-levels on the clamp to help do this right. Some early reviews of Sirui K-40x heads mention that the ball motion might be "sticky" rotating in a pan. I am not getting that with my sample. My biggest concern going into the future is that the rubber grips of the knobs do not disintegrate with time. My Vanguard monopod has lost every rubber grip of the twist-releases, but fortunately it had ribbed grips under the rubber and is still very usable. Now I will just briefly bring up the old tripod heads. That metal ball-head maybe looks alright in a photo, but using it was a different matter. This head is basically going to wait for a while until I decide to trash it. The head suffered from the drooping every time I used it. I had to firmly hold my camera whenever I loosened it and I found that difficult to compose a scene. Then there is the quick-release. The only part of it that works well is the clamp motion. The plate rattles in the clamp and moves easily. 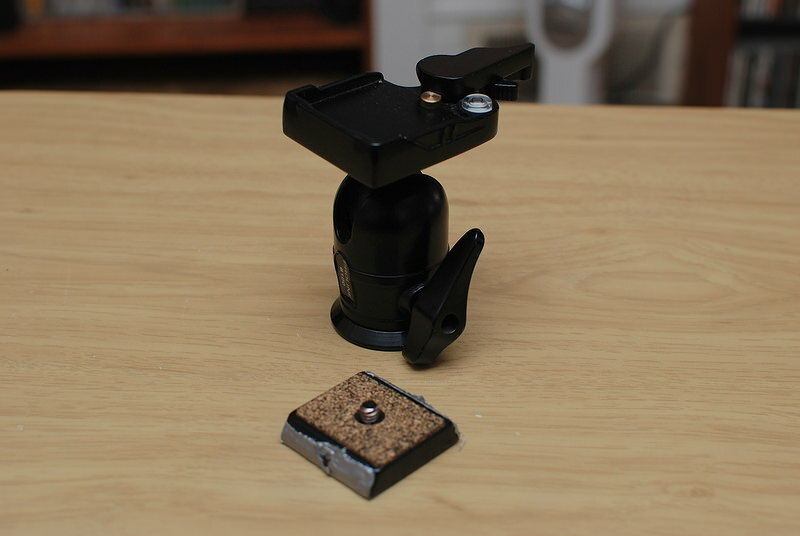 The plate itself is small, too small for the cork padding to grip a camera body. I added the duct tape to shim it up a bit and take out some of the rattling. Good riddance I say. 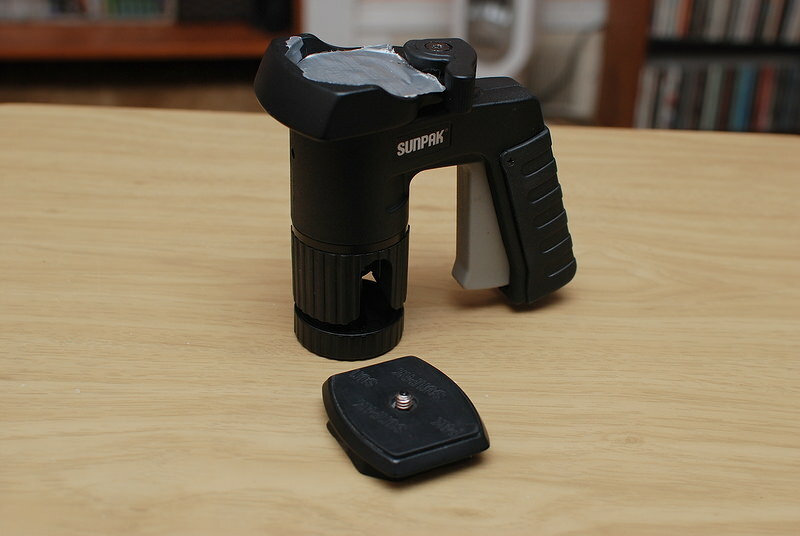 Now the Sunpak pistol-grip head. I like this head. It is quick and easy to position. The quick-release plate is large and has a rubber pad to grip a camera body. You compose by squeezing the grip to release the tension on the ball, move the head, then release. There is usually a minimal droop on release. But the head itself is mostly plastic. The ball is very small. 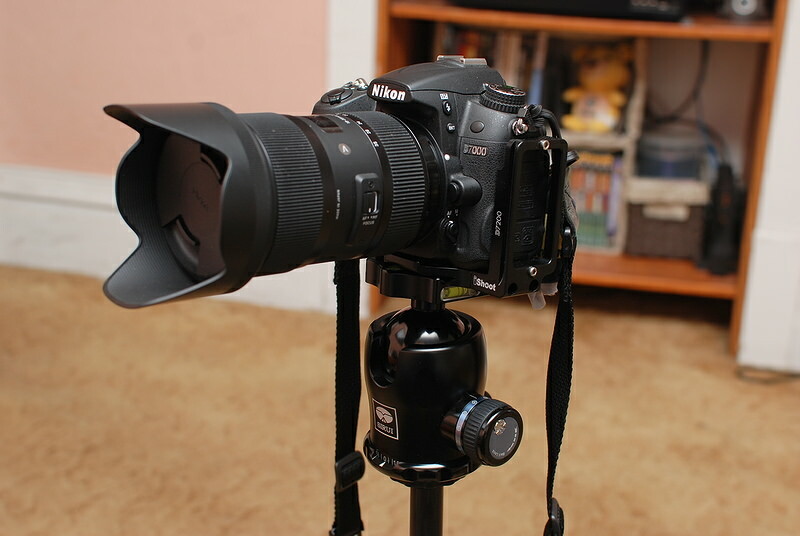 It supports a light load fine, but put a long lens on this and it gets shaky. Adding insult to injury, I swear this head is not the same as the one I sent back when I had the tripod repaired. The quick-release plate developed a bad rattling I did not notice before sending to Sunpak. I tried to address this with a number of attempted fixes. The one that actually worked was to duct tape all over the inside of the clamp. This shimmed all dimensions tight. It looks very ghetto though. I am going to continue to use this head. I added an Arca-Swiss quick-release on top of the existing quick-release, and I will give that a separate review. The head itself is transplanted to the cheap, lightweight aluminum tripod that the junker ball-head was on previously. This will work appropriately for a light body/lens combo, or else with my Coolpix 995 infrared-converted camera or even with my Panasonic Lumix point-n-shoot. Just an angle to show the ball sizes of these last 2 heads in comparison. Yeah, I needed the Sirui long ago. Like last summer when I was photographing the eclipse. Edited 1 time(s). Last edit at 04/11/2018 01:12PM by BF Hammer.